At a time when Amarnath Yatra is in focus following an attack on a bus in which seven pilgrims were killed in Botengoo, Islamabad last week and Kashmir’s left, right and centre came out in condemnation of the attack – the culpability of which is still clouded in doubt – attention must be drawn to the conflictual nature of the Yatra and its impact on Kashmir’s politics; inside and outside valley. Wande Magazine reproduces here a chapter from the report Amarnath Yatra: A Militarized Pilgrimage to understand the complexity of the yatra and the various political, cultural and ecological questions that the Yatra spawns and foists over Kashmir’s tense political terrain. As already established the Amarnath Yatra has had political compulsions which has gained increased proportions since the 1990s. From attempts to setting up permanent colonies to conflicts between service providers, the Yatra every year simmers with underlying tensions. This chapter looks at some of the more critical and violent conflicts between 1990 and 2015. Rarely does a year go by when there is no conflict linked to the Yatra. On the one hand are the socio-religious organisations who strive to assert their might by arguing for a longer Yatra, with more number of yatris to be permitted. This becomes another platform for right-wing Hindutva organisations to push their nationalist agenda. For the people of the Valley, for whom the Yatra has become a cultural and economic onslaught, these times of conflict reinforce the mandate for self-determination and force to rally around for their struggle for independence. At 6.45 pm on the evening of August 1st, 2000, there was an attack on the CRPF guarding the Amarnath Yatra base camp at Pahalgam by two unidentified gunmen. 27 people were killed of which 2 were police personnel and 50 injured, including yatris and local porters. Some eye witness accounts reveal that the gunmen were killed within the first 10 minutes of the exchange and that the overwhelming majority of the civilians were killed by the panic-stricken CRPF, who continued firing for twenty minutes even after the two attackers were killed. The massacre at Pahalgam was part of a series that took place in the Valley over August 1-2 2000, in which ninety people were killed. The then Home Minister admitted to having received general intelligence about a possible attack, and admitted that the CRPF had been alerted, but the massacre could not be averted. The government was also unable to conclusively suggest who the gunmen were, nor their organisational affiliations. While some reports claimed that it was the Lashkar-e-Toiba (LeT) which was behind the attacks, the government was unable to prove these claims, nor did the LeT stake claim to these attacks as they usually do. The Parliamentary opposition, mainly from the Congress Party, expressed its suspicions about what had transpired in Pahalgam, and demanded a judicial enquiry into the happenings, while several other parties in the opposition demanded the resignation of the then Home Minister. However, the ruling government was of the opinion that an administrative enquiry would be sufficient to unveil the truth. The government was also not in favour of ordering a judicial enquiry since it felt that would demoralize the armed forces. An Inquiry Committee was eventually ordered, headed by Lieutenant-General J.R. Mukherjee. However, this report has not been placed in the public domain and the gunmen remain unidentified. Some MPs also raised the issue of compensation to those killed. In the context of the attack on the Amarnath Yatra, the discussions centered around the yatris who had been killed, with no mention for the horse owners, who also serviced the Yatra. In another instance, on 21st July 2001, an unidentified gunman hurled two grenades near the Sheesh Nag camp killing twelve people and injuring thirteen. The Ministry of External Affairs alleged that the lone gunman was a member of the Lashkar-E-Toiba, without offering any evidence other than the claim that the person was carrying an incriminating document. In both these situations, the government claimed that the aim of these attacks was to disrupt peace talks. Yet in neither instances was an enquiry ordered, nor was any solid evidence presented that the gunmen were indeed linked to the organisations that the Government of India claimed they were from. A third instance of attack on the Yatra was reported on 6th August 2002, when two unidentified gunmen attacked the camp at Nunwan where 50 people died. There have been no attacks on the Yatra since 2002. A point to ponder in all these 3 instances, is that given that heavy bandobast of the armed forces and wide spread intelligence network, why was the Indian state not able to avert the attacks? In 2000, the government even admitted to have intelligence about an impeding attack but were not able to stop it. If the presence of the large numbers of the armed forces could do nothing to stop the 3 attacks that have happened between 2000 –2016, what is the justification of their presence on the Yatra route and what exactly is the threat perception that a key official of the CRPF spoke about, as reported in Section 4.3 of Chapter 4? On July 18, 2014 a fight between sewadars of a langar and a horse owner escalated into massive violence, causing extensive damage to property and injuring people. According to people of Baltal and Sonamarg, a fight broke out between a horse owner and a sewadar of the Baba Amarnath Sewa Mandal, Baltal over the issue of the langar opening up their closed shelter for accommodation of yatris, which is prohibited as per terms and conditions signed by all langar organisations. The CRPF in its attempt to dissipate the crowd and put a halt to the fight, only worsened the situation and eventually, the horse owner was stabbed. It was at this point that the fight took a violent turn, when several other sewadars and supporters of the horse owner joined the argument on their respective sides. The fight was in the area where all the langars are located and eventually 70 gas cylinders burst, causing the fire to spread across the langars. The wind then carried the fire to the tents as well. A total of 110 tents including nine langars were destroyed, and about 50 people injured. A few hours after the fight erupted, the district administration and the SASB reached Baltal. Cases were booked against two CRPF constables and two sewadars. After investigation, a compensation of Rs 25,000 for tent owners and Rs 50,000 for langars was announced. The amount offered as compensation does not cover either the tent costs or damages caused to the langars. While the tent owners decided to cut their losses and accept the compensation money, the langars refused to take the compensation. When the team met with the police officials at the Sonamarg Police Station, under whose jurisdiction, Baltal falls, they said that at the end of the Yatra, the two sewadars had returned to their homes outside J&K. There are slim chances that any further steps can be taken, since the police felt that the specific sewadars will not return the next year. What is also important to note is that it was not the langar organisation against whom the FIRs were lodged, but only individual sewadars. That the sewadars participate as volunteers of the langars, the langar organisations need to be held accountable and relevant action needs to be taken against them. The armed forces present are always on the ready to engage in the conflict, contributing the volatile atmosphere of the camps and the Yatra. This and the impunity with which langar organisations function prove to be extremely intimidating. Over a period of time, since several service providers participate year after year antagonism and earlier conflicts / skirmishes remain in people’s mind, which results in eruptions such as what happened in 2014. For example one perception is that the 2014 incident is that it was a planned act of revenge by the CRPF against the JKP. In 2013, the same battalion of the CRPF was stationed in Baltal and they had a run-in with the JKP, who took the side of the tent owners in a conflict that year. During the months of the Yatra, the regions of J&K are constantly on high alert, with the government only fuelling this fire, by repeatedly and regularly claiming imminent attacks by terrorists. It almost seems like the government creates an atmosphere of distrust between the people of Jammu and Kashmir and pushes its agenda for continued presence of large numbers of armed forces in the Valley. In 2004 the SASB, through the then Principal Secretary, Governor of J&K and CEO, SASB, Arun Kumar placed a request for transfer of forest land for setting up infrastructure for the Amarnath Yatra. The request was for 3642 kanals of land, in multiple places along both the routes. On March 29, 2005, a piece of land at Baltal was allotted to the SASB, by the Secretary, Forests, Ms Sonali Kumar, who also happened to be the wife of Arun Kumar. From the letter it can be inferred that the area was snow bound at the time of approval of transfer and therefore an on-site assessment had not been possible. Based on interviews with people of the Valley, it appears that much of the land earmarked to be handed over was in the possession of local people whose rights were secured as per the Government Order No. LB 6/C of 1958 dated 5-6-1958 read with Government Order No. S/432 of 1966 dated 3-6-1966, which says that tenancy of those who had cultivated kharif crop of 1957, would be protected. According to these Government Orders, tenants may not be removed from their land and the rights were heritable. Yet, the state transferred the land unmindful of their tenancy and ownership rights. However, the state government continued to be opposed to the transfer of land and appealed against the 15th April 2005 judgement with the argument that the transfer violated the spirit of the Supreme Court judgements on forest lands. The bench comprising of Justices V.K. Jhanji and Y.P. Nargotra upheld the directions of Justice Kohli and discharged the petition giving its judgement on 17th May 2005. The judgement issued directed that the SASB, “convene a meeting of the Board within 10 days from today. The Board in the meeting shall associate Chief Secretary of the State, Divisional Commissioner Kashmir, Director General of Police, J&K and the Commanding Officer who shall point out any difficulty, which the Government may be facing in carrying out the directions already taken by the Board and also the directions of the learned Single Judge. The Board shall also consider the difficulty, if raised by any of the party, objectively and then take decision afresh.” There was no attempt to engage even the relevant Ministers, leave alone the concerns of civil society. Between 2005 and 2008 several attempts were made to acquire land for construction of infrastructure for the Yatra. On May 20th, 2008 the Cabinet approved the transfer of 39.88 ha (800 kanals) of land to the Shrine Board and the order was passed on May 26th. On June 3rd, a spokesperson from Raj Bhavan announced the land transfer. On June 17th, Governor Sinha’s Principal Secretary and SASB CEO Arun Kumar issue’s a statement in a press conference in Srinagar that land diversion was permanent. Protests in the Valley erupted on June 23rd, 2008 and went on till August 2008. This conflict eventually caused the fall of the government of the day, and resulted in the death of about 61 people. What started as a resistance to the transfer of land quickly turned into an assertion of the right to self-determination, and a sustained and concerted resistance was launched by the Action Committee against Transfer of Land (ACTL). Planned agitations, engagement with the media, dissemination of the issue on social media networks were some of the aspects of this resistance. The people of Kashmir believe that the Amarnath land row inadvertently gave impetus for a renewed vigour for its freedom struggle, that it helped mobilise more people for the separatist cause, including a large number of young people. People from more affluent backgrounds, who were unwilling to understand and support the separatist perspective, also started doing so, especially after the economic blockade supported by the BJP in Jammu. While Kashmir came together to struggle against the land transfer, there was an equally violent reaction in Jammu. The VHP, Hindustan Shiv Sena (HSS), Bajrang Dal, Akhil Bhartiya Vidhyarti Parishad (ABVP), BJP and RSS felt that while the BJP was at the forefront in terms of issuing statements regarding the land row, there was a need for a movement on the ground to respond to the resistance that was brewing in Kashmir. With the RSS at its helm the Shri Amarnath Yatra Sangharsh Samiti (SAYSS) was formed with the involvement of all these groups. Support of Jammu traders associations, Kashmiri Pandit organisations and other social and cultural groups were solicited. The SAYSS had 3 primary demands: Restore Baltal land to the SASB; Re-establish the Board, and Recall the Governor. Among other forms of agitation, economic blockades were used as a way to suffocate Kashmir. A first blockade was announced on June 23rd (for three days) and again on July 2nd. This disrupted life across the region, with reports of shortfalls of food grains, medicines and other daily necessities. Horticulture too was adversely affected with fruits rotting and the traders incurring heavy losses. On August 11th, traders in Kashmir staged a protest against the blockade and fruit growers gave a call for Chalo Muzafarabad, a protest march to the first town across the Line of Control in Pakistan controlled Kashmir. During this march a Hurriyat leader Sheikh Abdul Aziz was killed. In retaliation more than 300,000 people marched to Pampore. 61 civilians in Kashmir were killed by the armed forces during the agitation. The Amarnath Yatra was in full swing when the agitation erupted. But not a single yatri was attacked by Kashmiris. On the other hand, people of Srinagar and towns along the roads to Pahalgam and Baltal, set up langars to provide food for the yatris. In the meantime, the Chief Minister had resigned and Governor’s rule was imposed on July 10th. Finally, on August 31st, an agreement was signed between SAYSS and the Government represented by the Governor. The land row, however, had some irrevocable implications on Kashmiri trade and society. Kashmiri traders realized the vulnerability of being dependent on Jammu for the sale of their products, and started directly accessing markets in India, and focusing on markets abroad. The Jammu traders on the other hand also realized the dangers of mixing business with politics, since the blockade had affected them as well. Yashpal Gupta, Jammu Traders Association told the team that they were also invited to be part of the SAYSS. He admitted that while they did participate in the agitation, they soon realised that this was politically motivated, had little to do with religion and with their businesses at stake, they were paying the price. People like Yashpal Gupta had tried convincing the SAYSS that the economic blockade was affecting the Jammu traders as well and that it should be withdrawn. When they realized that the SAYSS would not yield, they withdrew their participation. The effect of the blockade was felt for over a year. Finally the Jammu Chamber of Commerce met with the Kashmir Chamber of Commerce to re-establish business ties. However, according to the some members of the Kashmir Chamber of Commerce, the fissure created in August 2008 would not be completely filled. Some of the Muslims in Jammu shared that the response in the region was shocking and it was only then that they realized the ground work that the VHP, RSS and BD were doing quietly. They also believed that the educated class found a space to assert themselves through apparently visionless rallies, with tridents (trishuls) dominating the visuals, and slogans of Bam Bam Bholey reverberating in the air. With the media in Jammu focused on Islamic symbols of the resistance in Kashmir, the conflict was turned into one of Muslim vs. Hindu conflict, rather than one of Kashmir vs. Jammu. It was on this basis that the SAYSS also mobilized the Kashmiri Pandit community. K.K. Khosa, President, Kashmiri Pandit Sabha, said, “while we were invited to be members of the SAYSS, the Sabha did not play an active and vocal role in the Samiti or in public”. Instead, what seems to be important to the Kashmiri Pandits was that if the Board was a Kashmiri Pandit Board, the Kashmiri Muslims would not have been able to allege that the transfer of land was a front to change the demography of the Valley. Mr. Khosa was also of the opinion that Kashmiri Pandits could have played a major role in establishing goodwill among the different service providers. For example there is a perception that Kashmiri Muslims feel that the potential for them to earn from the Yatra by way of selling food has been limited due to the presence of the langars who provide free food to the yatris. Mr. Khosa believes that if Kashmiri Pandits were present in the Board, they could have been the link between the different service providers and the local people. Using this order, Jammu groups again started putting pressure on the government to revive the idea of Amarnath Nagar. 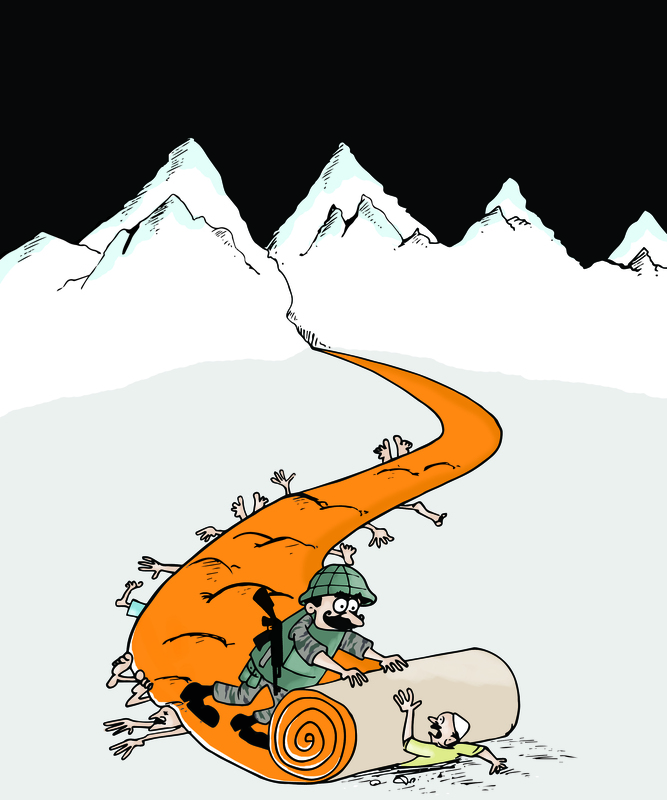 Memories of 2008, the observations of the court and the construction material lying in the Amarnath route triggered concerns in Kashmir’s civil society. Armed with photographs of material that was found in Chandanwari, Hurriyat leader Syed Ali Shah Geelani, issued a press statement exposing this and condemning the development. Several people of Kashmir civil society also released public letters on the same. Like in 2008, concerns were largely around environmental impacts of such large scale development in an eco-fragile region. The government laid to rest any kind of dissent by issuing a statement that there were no such plans and that the Supreme Court has not approved any such construction. During the team’s visit to Jammu, Rajesh Gupta shared the proposals to build a series of tunnels from Chandanwari to Panchtarni and then to Baltal, which would further connect to the tunnel at Zojila Pass, one of whose exits would be barely a few kilometers from the cave. Clearly, socio-religious organisations and the government are adamant about seeing through the road to the cave. It would then be a matter of time before they start the fruition of the idea of Amarnath Nagar at the cave. Given that the perpetrators of the supposed attacks on the Yatra between 2000 – 2002 have not been conclusively determined, the more prominent nature of conflict in the past decade has been linked to the position or use of the Yatra (including its institutional framework) in influencing the political scenario in Kashmir. The nature and extent of conflict vis-à-vis the Yatra has grown over the years and in 2008 was the cause of the death of 61 people. The SASB and the Government of India do not feel the need to respond to this crisis. Indian secularism and democracy has become the sacrificial lamb in this conflict. Trick and deception are being used by the State to accomplish its goals. For e.g. the canals that are to be built are being done as defence projects, so that they are exempt from environmental clearances. The Government of India is well aware that any attempt to build any form of permanent infrastructure of this nature would result in another round of heightened conflict in Kashmir with a likelihood of not being permitted under the environmental law as well. Yet, the State will not apply its strategies to resolving the conflict and instead is intent on bypassing the issue itself.